Meerkat is the common name for a small, gregarious, burrowing mammal, Suricata suricatta, of the traditional mongoose family Herpestidae, characterized by a long, slender body, short legs with four toes on each foot with non-retractile claws, small crescent-shaped black ears, and a long tail that tapers to a black or reddish colored tip. Also known as a suricate, this diurnal animal inhabits open country in Southern Africa, living in groups in large underground networks with multiple entrances. Very social animals, meerkats also demonstrate altruistic behavior within their colonies. In particular, they are known for their sentinel behavior whereby one or more meerkats climb to a vantage point and scans the surroundings for danger while the others are foraging or playing. If the sentinel detects a predator, it gives a loud alarm call to warn the troop. The sentry meerkat also is the first to reappear from the burrow and search for predators, constantly barking to keep the others underground until it is ascertained that it is safe for the others to emerge. In addition, females that are not producing offspring of their own have been known to lactate and feed the alpha pair's young and to protect the young from threats, often at risk to their own lives. Ecologically, meerkats play an important role in food chains, being primarily insectivorous but also consuming various vertebrates and other animals, while being consumed by snakes, birds of prey, and other predators. For humans, in addition to adding to the wonder of nature and being popular zoo exhibits, they also help to control some agricultural pests. As with other members of the mongoose family Herpestidae, meerkats have long faces and bodies, small rounded ears, short legs, and long tapering tails. Their small, rounded heads have a pointed, short muzzle that lacks a noticeable stop (an indentation between the forehead and the muzzle), unlike the similar viverrids (family Viverridae) that have a definite stop (Postanowicz 2007). The small, rounded ears of herpestids are set very low on the sides of the head, unlike viverrids, which have ears that are longer and set higher on the head (Postanowicz 2007). The meerkat is a small herpestid, weighing on average about 731 grams (1.61 pounds) for males and 720 grams (1.58 pounds) for females. Its long slender body and limbs give it a body length of 25 to 35 centimeters (10 to 14 inches) and an added tail length of 17 to 25 centimeters (7 to 10 inches). Its tail is not bushy like all other mongoose species, but is rather long and thin and tapers to a black or reddish colored pointed tip. The meerkat uses its tail to balance when standing upright. Its face tapers, coming to a point at the nose, which is brown. The eyes always have black patches around them, which help deflect the sun's glare. 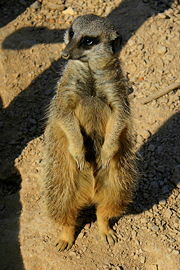 The meerkat has small black crescent-shaped ears that can close when digging to keep sand out. Like cats, meerkats have binocular vision, a large peripheral range, depth perception, and eyes on the front of their faces. A meerkat, standing on its hind legs, looks around at Ueno Zoo in Japan. At the end of each of a meerkat's "fingers" is a non-retractable, strong, 2 centimeters (0.8 inches) long, curved claw used for digging underground burrows and digging for prey. Claws are also used with muscular hindlegs to help climb the occasional tree. They have four toes on each foot and long slender limbs. The coat is usually fawn-colored, peppered with gray, tan, or brown with a silver tint. They have short parallel stripes across their backs, extending from the base of the tail to the shoulders. The patterns of stripes are unique to each meerkat. The underside of the meerkat has no markings but the belly has a patch which is only sparsely covered with hair and shows the black skin underneath. The meerkat uses this area to absorb heat while standing on its rear legs, usually early in the morning after cold desert nights. Meerkats are found in Southern Africa, in all parts of the Kalahari Desert in Botswana and South Africa, as well as in Angola and Namibia. Meerkats have an average life span of 12 to 14 years. Meerkats are small burrowing animals, living in large underground networks with multiple entrances, which they leave only during the day. They are very social, living in colonies averaging 20 to 30 members, known as a "clan," "gang," or "mob." Animals in the same group regularly groom each other to strengthen social bonds. The alpha pair often scent-mark subordinates of the group to express their authority, and this is usually followed by the subordinates grooming the alphas and licking their faces. This behavior is also usually practiced when group members are reunited after a short period apart. Most meerkats in a group are all siblings or offspring of the alpha pair. Meerkats demonstrate altruistic behavior within their colonies; one or more meerkats stand sentry (lookout) while others are foraging or playing, to warn them of approaching dangers. When a predator is spotted, the meerkat performing as sentry gives a warning bark, and other members of the gang will run and hide in one of the many bolt holes they have spread across their territory. The sentry meerkat is the first to reappear from the burrow and search for predators, constantly barking to keep the others underground. If there is no threat, the sentry meerkat stops signaling and the others feel safe to emerge. Despite this altruistic behavior, meerkats sometimes kill young members of their group. Subordinate meerkats have been seen killing the offspring of more senior members in order to improve their own offspring's position (Norris 2006). Meerkats actively teach their young. Young of most species learn solely by observing adults. For example, meerkat adults teach their pups how to eat a venomous scorpion: they will remove the stinger and help the pup learn how to handle the creature (Thornton and McAuliffe 2006). 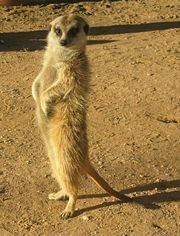 It has recently been noted that meerkat calls may carry specific meanings, with specific calls indicating the approach of snakes, birds of prey, or other predators. How these calls work is not yet clear. A meerkat group may die out because of predator attack, its alpha pair being unable to breed, starvation in a year when the rains fail, or epidemic disease. A new meerkat group often arises from evicted females meeting and staying with roving males, looking for chances to mate. The litter size is usually 2 to 5 pups. Meerkats showing foraging behavior at the Adelaide Zoo. Meerkats are primarily insectivores, but also eat lizards, snakes, scorpions, spiders, plants, eggs, small mammals, millipedes, centipedes and, more rarely, small birds. They are partially immune to certain venoms. They are immune to the very strong venom of the scorpions of the Kalahari Desert, unlike humans (Attenborough 1986). They have no excess body fat stores, so foraging for food is a daily need. Baby meerkats do not start foraging for food until they are about 1 month old, and do so by following an older member of the group who acts as the pup's tutor (Deborah 2007). Their behavior and small size (they weigh less than one kilogram) makes them very vulnerable to larger carnivores and birds of prey. However, the meerkat has been known to eat small birds that migrate through Southern Africa. Meerkats become sexually mature at about one year of age and can have 1 to 5 pups in a litter, with 3 pups being the most common litter size. Wild meerkats may have up to four litters per year. Meerkats are iteroparous and can reproduce any time of the year but most births occur in the warmer seasons. The female meerkat can have more than one litter a year. The pups are allowed to leave the burrow at three weeks old. When the pups are ready to emerge from the burrow, the whole clan of meerkats will stand around the burrow to watch. Some of the adolescents might act in a manner as if trying to show off so they can have more attention than the pups. Reports show that there is no precopulatory display; the male ritually grooms the female until she submits to him and copulation begins, the male generally adopting a seated position during the act. Gestation lasts approximately 11 weeks and the young are born within the underground burrow and are altricial. The young's ears open at about 15 days of age, and their eyes at 10 to 14 days. They are weaned around 49 to 63 days. They do not come above ground until at least 21 days of age and stay with babysitters near the burrow. After another week or so, they join the adults on a foraging party. Usually, the alpha pair reserves the right to mate and normally kills any young not its own, to ensure that its offspring has the best chance of survival. The dominant couple may also evict, or kick out the mothers of the offending offspring. New meerkat groups are often formed by evicted females pairing with roving males. 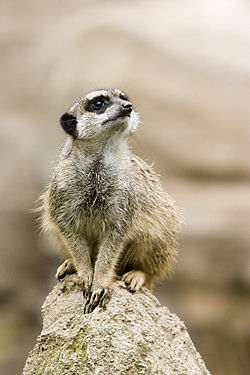 "Meerkat" is a loanword from Afrikaans. The name has a Dutch origin but by misidentification. Dutch meerkat refers to the "guenon," a monkey of the Cercopithecus genus. The word "meerkat" is Dutch for "lake cat," but the suricata is not in the cat family, and neither suricatas nor guenons are attracted to lakes; the word possibly started as a Dutch adaptation of a derivative of Sanskrit markaţa मर्कट = "monkey," perhaps in Africa via an Indian sailor onboard a Dutch East India Company ship. The traders of the Dutch East India Company were likely familiar with monkeys, but the Dutch settlers attached the name to the wrong animal at the Cape. The suricata is called stokstaartje, meaning "little stick-tail" in Dutch. The scientific name suricate comes from the Swahili language and it means "rock-cat." According to African popular belief (mainly in the Zambian/Zimbabwean region), the meerkat is also known as the sun angel, as it protects villages from the moon devil or the werewolf, which is believed to attack stray cattle or lone tribesmen. Attenborough, D. 1986. Meerkats United. (Wildlife on one.) Bristol: BBC. OCLC 220474692. BBC. 2006.Meerkat pups go to eating school: Meerkat pups do not learn how to eat dangerous animals such as scorpions on their own but are taught by adults, scientists have discovered. BBC News, July 13, 2006. Retrieved December 8, 2008. Deborah. 2007. Mighty masked meerkat mobs. Lifeinthefastlane.ca December 7, 2007. Retrieved December 8, 2008. Dennis, N., and D. Macdonald. 1999. Meerkats. London: New Holland Publishers, 1999. ISBN 1868723100. Fuehrer, T. 2003. Suricata suricatta. Animal Diversity Web. Retrieved December 08, 2008. Macdonald, D., and M. Hoffmann. 2008. Suricata suricatta. In IUCN, 2008 IUCN Red List of Threatened Species. Retrieved December 8, 2008. Norris, S. 2006. Murderous meerkat moms contradict caring image, study finds. National Geographic News, March 15, 2006. Retrieved December 8, 2008. Postanowicz, R. 2007. The Herpestidae family. Lioncrusher.com. Retrieved December 8, 2008. Thornton, A., and K. McAuliffe. 2006. Teaching in wild meerkats. Science 313(5784): 227–229. PMID 16840701. Retrieved December 8, 2008. This page was last modified on 22 December 2008, at 22:23.